Kabuto Noodles very kindly sent me three new flavours to try. Along with this Chicken Laksa, there is Vegetable Laksa, and Chicken Pho. 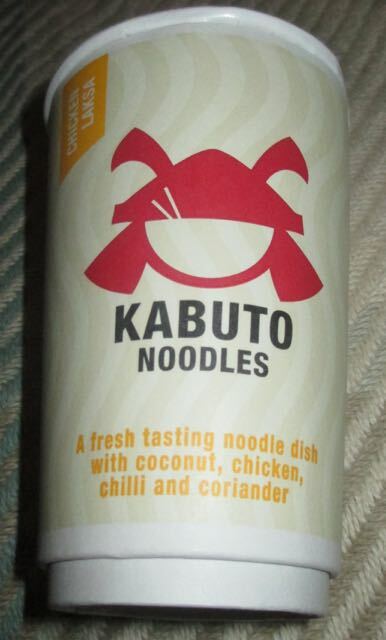 I've tried a few of Kabuto's noodle flavours before and rather enjoyed them. I've recently seen them sitting proudly in Waitrose, so they're readily available for you to try. This Chicken Laksa is a noodle pot with coconut, chicken, chilli and coriander in the ingredients. I'd forgotten just how full the cardboard pot would be of noodles. No mixing here, just add freshly boiled water and leave the lid on for a few minutes. After a stir I could see plenty of diced vegetables mixed in with the multitude of noodles. There was a ginger and turmeric smell mixed in with the coconut and chicken. Once the concoction had cooled a little I found this Chicken Laksa was very tasty. It was a really different twist on the traditional chicken soup, mainly because I actually liked it! I've never been keen on chicken soup as a traditional soother when I'm ill, rather preferring tomato soup. Not that I'm ill right now (fingers crossed), but I'm just stating a fact. With this Chicken Laksa I could taste the chicken, the millions of pieces of diced coriander mixed with the heat from the chilli and the warming ginger spice and turmeric, as well as the cooling qualities from the coconut. A complex group of flavours that'll clear your nose and sooth you from any cold or flu over the winter period. Or just because you fancy a spicy chicken noodle soup. Nice one Kabuto. 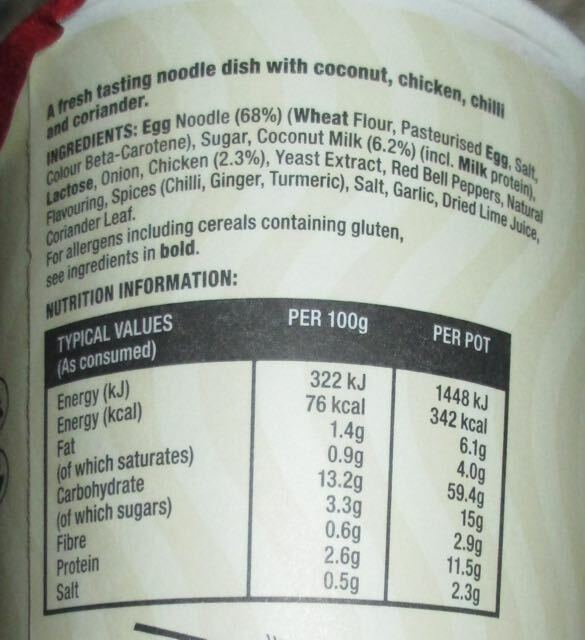 85g pot (450g with freshly boiled water added), has 342 calories, and has 6.1g of fat, 15g of sugar and 2.3g of salt. Please see photograph for ingredients.